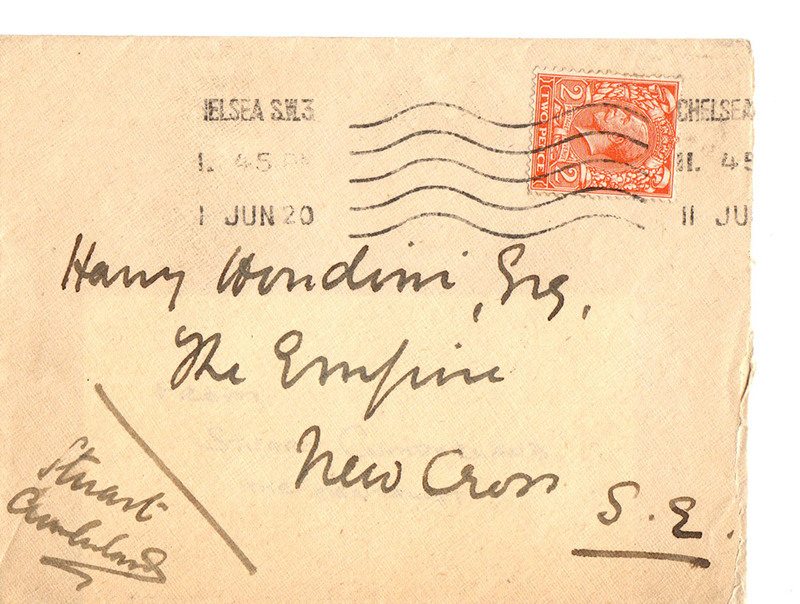 It is postmarked June 20 (year unknown) from Chelsea, England. There is no return address, but Stuart Cumberland wrote his own name in the lower left corner. Stuart Cumberland died in 1922, so this letter was obviously written no later than 1922. 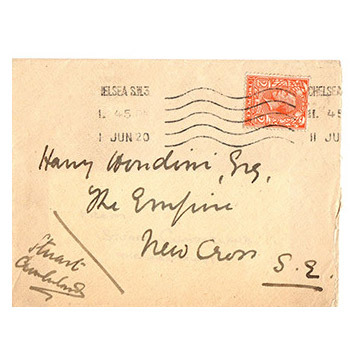 The envelope was addressed to Houdini while he was appearing at the historic Empire Theatre in Southend-On-Sea, Essex. 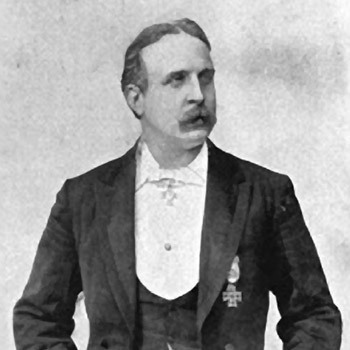 Stuart Cumberland (1857-1922) was the stage name of Charles Garner, an English magician who specialized in thought reading or mentalism. His most famous routine was finding objects hidden by audience members by using "psychic powers". 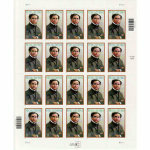 He was also a skilled writer who penned Spiritualism: The Inside Truth, and exposure of fake mediums and their methods. This was a very important topic to Houdini; in fact, fully half his stage show during this time was all about exposing fake spiritualists. It can be imagined that Cumberland and Houdini had quite a number of conversations about this matter, including what was sent in this envelope. As a side note, the Empire Theatre at this time was owned and operated by the successful illusionist Albert Marchinsky, stage name "The Great Rameses". The theatre unfortunately was hit by an arsonist in 2015, and was demolished a year later. This is a standard size envelope (about 3" x 4"). It's old, it's been through the mail, it's yellowed. Houdini tore it along the right edge (probably with a dull letter opener) to remove the contents. Buy this item - get 90 Rewards Points!